This image, captured by the NASA/ESA Hubble Space Telescope's Wide Field Camera 3 (WFC3), shows a galaxy named UGC 6093. As can be easily seen, UGC 6093 is something known as a barred spiral galaxy—it has beautiful arms that swirl outwards from a bar slicing through the galaxy's center. It is classified as an active galaxy, which means that it hosts an active galactic nucleus, or AGN: a compact region at a galaxy's center within which material is dragged towards a supermassive black hole. 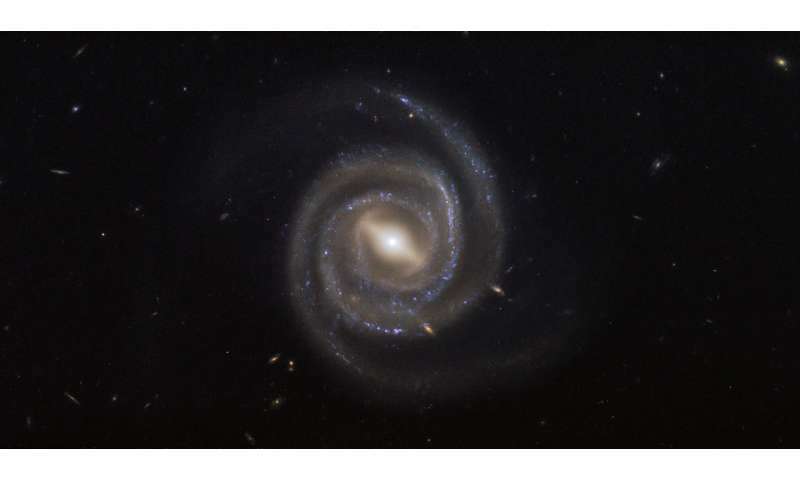 Using data from the Hubble Space Telescope’s famous Ultra-Deep Field (UDF) observation, astronomers have been able to deduce at what age spiral galaxies acquire their spiral structure.